The issue of syntactic development is one of the most central in both linguistics and applied linguistics. Assuming no detailed background knowledge of linguistics, this is an introduction to the acquisition of syntax in a second language. The text builds a coherent picture of second language grammatical development by showing the interactions between the syntactic, processing and functional/discourse approaches, and looks at how and why these different approaches give different results. 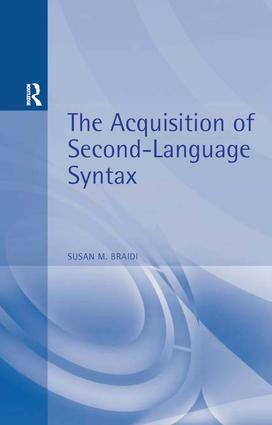 Providing a synthesis of the latest work in this area, the text looks at the implications of second language syntax research for the classroom. A very competent overview of the literature which will give the reader a fair understanding of the approaches taken and a good knowledge of what sorts of research have and have not been done. Clearly structured, plainly written and includes just enough detail and theory not to misrepresent theories but still remain accessible to its intended readership. Conclusions: An Integrative perspective of L2 acquisition of grammar.